Some people are completely unaware of just how filthy their smartphones are. Other people know full well that smartphones are a hotbed for gross bacteria, but they still don’t bother to do anything about it. 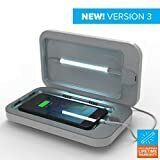 The PhoneSoap 3 UV Cell Phone Sanitizer is a device that was initially funded on Shark Tank that should be an essential accessory for every smartphone owner. It’s basically a box that blasts your phone with UV light, killing 99.99% of bacteria on both sides and on the edges of your phone. Please, do yourself a favor and get one.